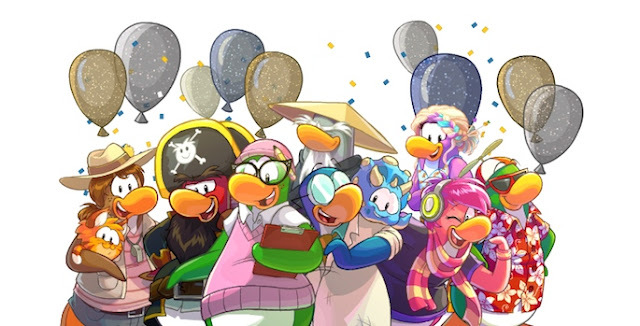 Hello everyone, Club Penguin is turning A DECADE OLD this month, so they've thrown a party that will last from now (September 30th) to their actually anniversary day, which is October 24, 2015. 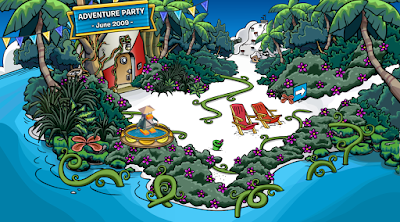 To celebrate, Club Penguin have completely transformed the whole island, adding rooms from old parties based on votes, and releasing a new party hat. You can also pick up a new item every day! So let's get started with the Tenth Anniversary party walkthrough, shall we? A new pin has been released on the island, the 332nd pin of all time, the Descendants pin. 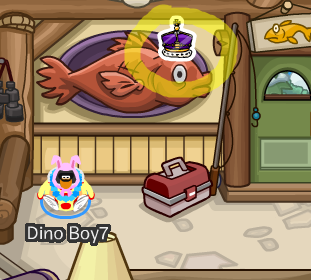 To get the pin, waddle over to the School, located at the Mine Shack and click on it to pick it up. Congratulations, you have just picked up the newest Club Penguin pin, the Descendants pin. Waddle on! 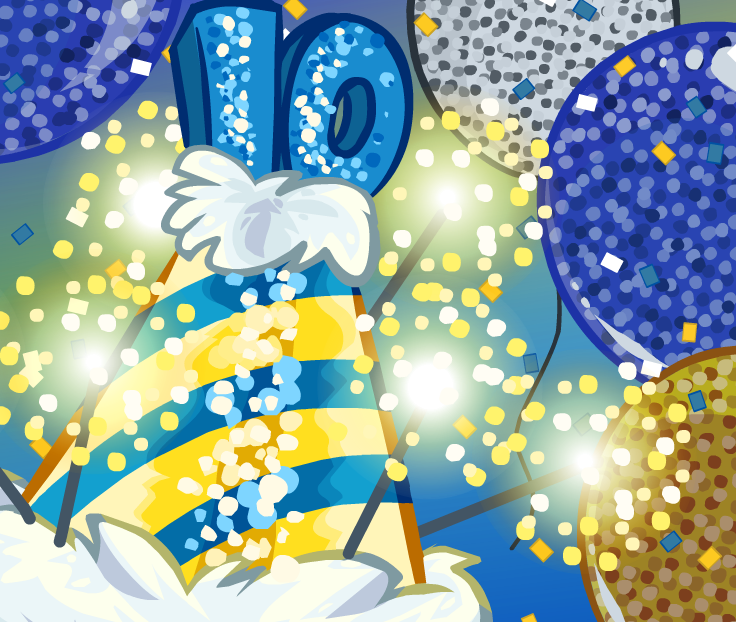 Club Penguin's party celebrating their 10th anniversary has hit the island. 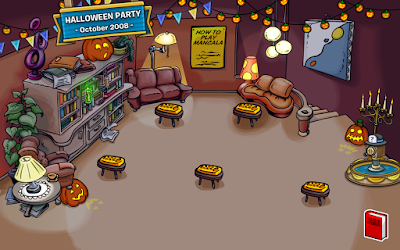 Every single room (almost) has been updated to showcase a party from throughout the years, ranging from the 2005 Christmas party, to the June 2007 summer kickoff party, all the way to the 2015 pi day celebration. Below you will find all of the rooms that have been decorated and the corresponding party. Click the rooms to enlarge them! Club Penguin Times Issue #519 - The 10th Anniversary Is Here! What's black and white and read all over? 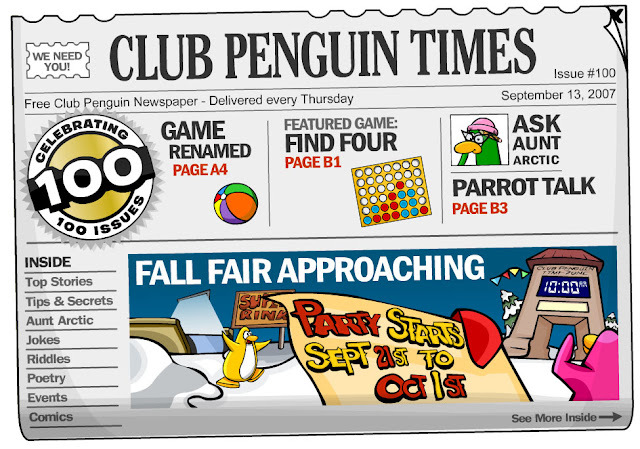 The Club Penguin Times, Club Penguin's weekly newspaper! And the 519th issue has just arrived. Read it now! Headline: the 10th anniversary is here! 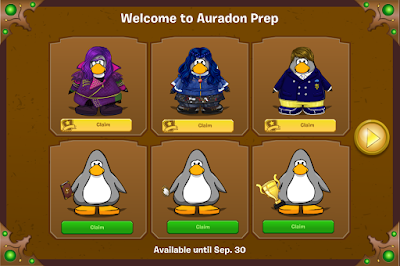 One of the login billboard screens on Club Penguin has updated to advertise the October 2015 Penguin Style clothing catalog that will be released during the Wednesday updates this week. The advertisement features an assortment of items purchasable in the catalog with the title "SPOOKY ITEMS FOR MEMBERS THIS MONTH". When the catalog is released, I will publish a link here to view it. Click below to find the meet-up times for ALL of the Club Penguin mascots visiting during the 10th Anniversary Party. The times are listed in PST. 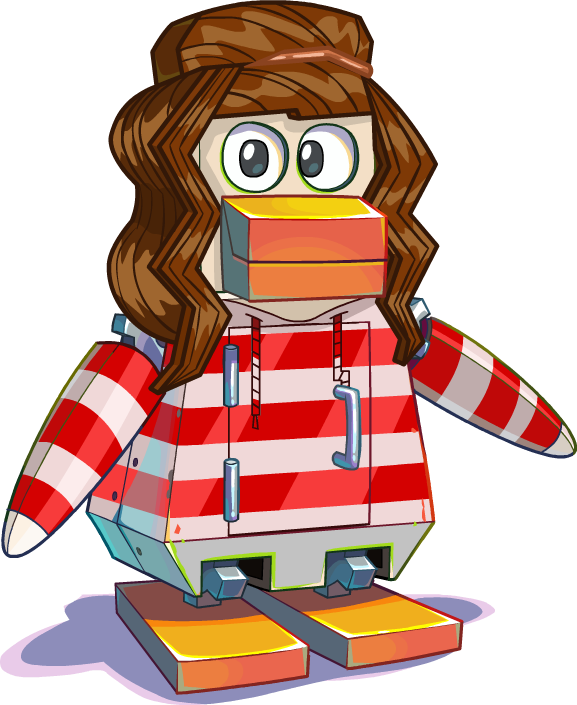 Club Penguin Blog: MeggBOT? & Anniversary Party This Week! A new blog post has been made on Club Penguin's 'What's New' section entitled "Anniversary Party Begins This Week!" Megg talks about the 10th anniversary party starting this week and... MeggBOT? You can read it below. Also, watch for an exclusive 10 year Anniversary blog series we're calling CP Time Warp. We've been digging through some of our paper and digital archives to bring you some cool, never before seen about info from the past. We're super excited to share things we've never shared before! P.S. Featured Fashions will be postponed until next Monday -- so stay tuned! 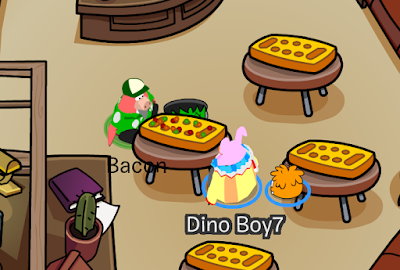 The Coffee Shop is one of Club Penguin's greatest and most heart-warming places. Located in the Town on the left, it is one of the first rooms to be created and a place where all penguins can go, whether they're feeling sad or happy, to pick up a coffee and have a chat with their friends! 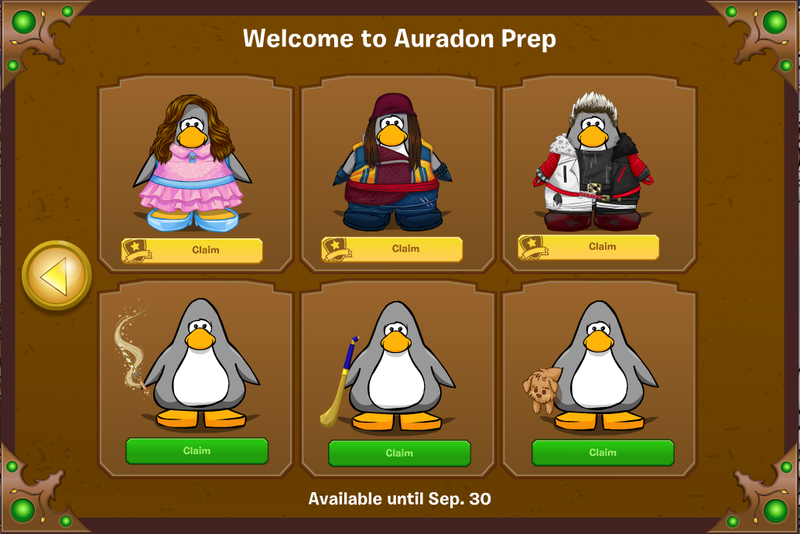 I used to love meeting my penguin pals back when I joined the game, and I'm sure you've all had some fond memories in there. Let's share some of the great designs and times that have been shared in the Coffee Shop. 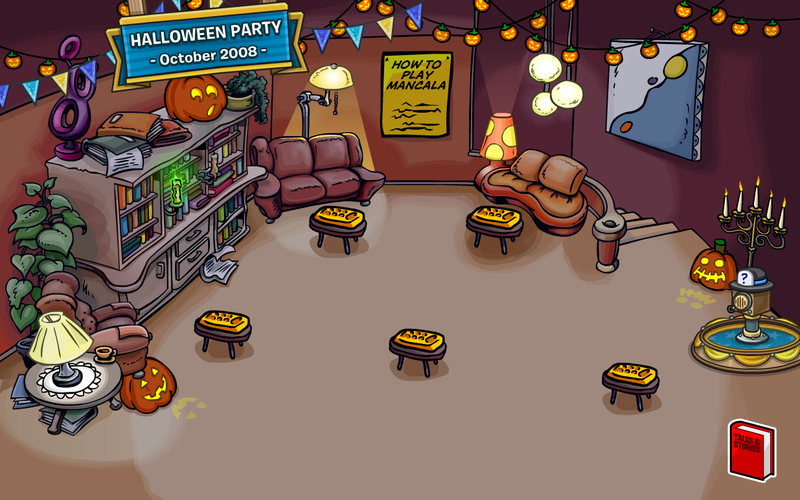 The room originally opened on March 31, 2005 on Penguin Chat 3, but it's first official launch on Club Penguin was October 24, 2005, right after beta testing. Here's what it looked like, feel free to expand the image to view more, simply click on it. The Coffee Shop remained this design for many many years, only changing for a few parties. Come August 30, 2012, the whole Coffee Shop design was revamped. 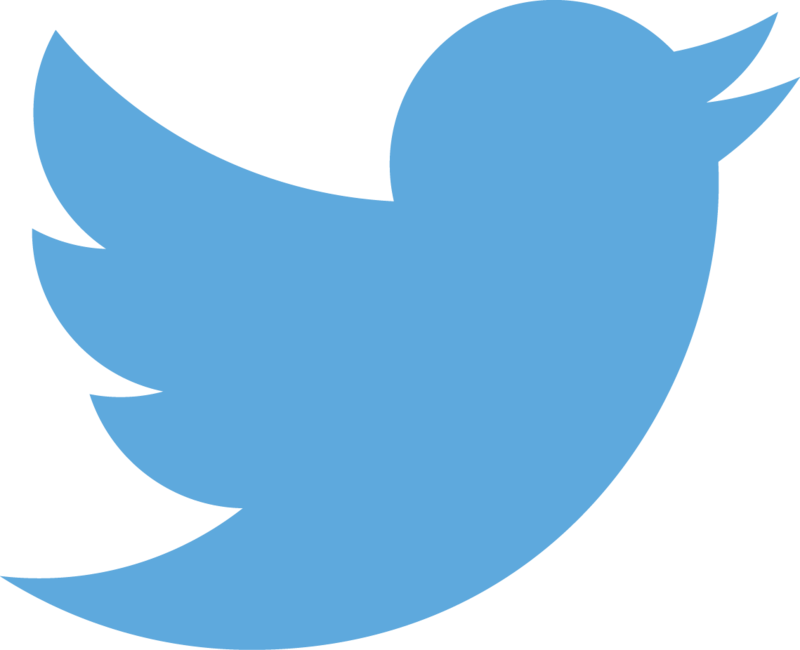 The team hinted at it's redesign for many days before officially releasing it to the public. Keeping the original style and layout, the Coffee Shop was updated to suit the surge of new players that would join. The game Smoothie Smash was also added, being the second game introduced, after Bean Counters. The Coffee Shop truly is a magical place. Never did I realise that from such a simple place to grab a drink would so many fun times and memories come. The original design brings a sense of nostalgia to me, as I remember way back in 2007 when I joined and saw it for the first time, I can still picture how modern and cool it looked. Now there are too many features I believe, that's the reason most penguins don't hang out there. Nevertheless it is a lovely place, let's recall some times the shop had been designed for parties. 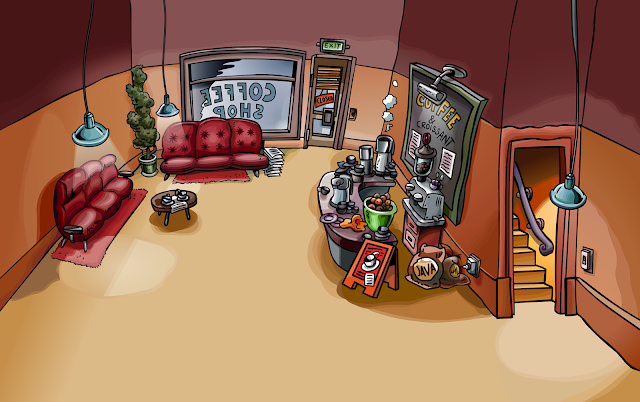 Here is the Coffee Shop during Club Penguin's 2007 St Patrick's Day party. 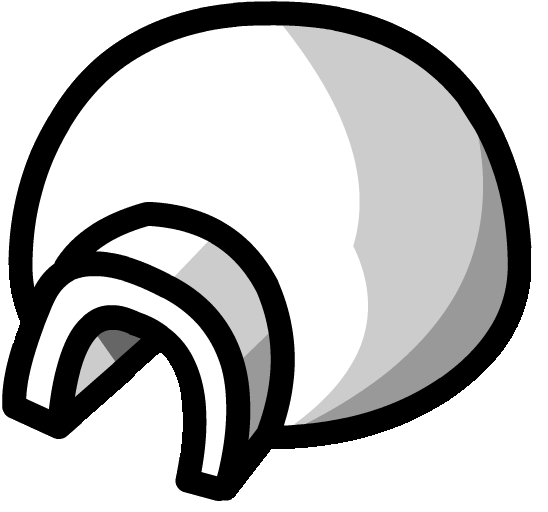 And here it is during the 2008 Water Party on Club Penguin. I LOVE the inflatable seats. Thanks for so many awesome times, Coffee Shop! We'll never forget you. When you click the 'M' symbol on Club Penguin, it brings up the Online Safety Quiz, with 6 question about online safety you can answer to win a free sweater. 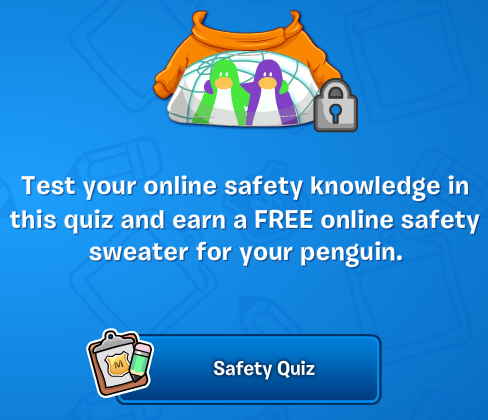 Today I will be giving you the Safety Quiz Answers and teach you how to get the Safety Sweater on Club Penguin. It's that time again, it's the newest Club Penguin history post. Every so often, I will create an article showcasing a piece of history from the game. Whether it is a super old pin, clothing catalog, party hat or even just a room. I've decided to talk about a super old event that happened on the Club Penguin island back in 2007: 100th Newspaper Event! 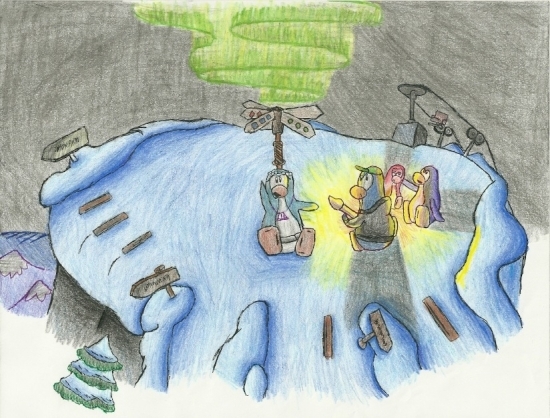 When the official weekly newspaper, the Club Penguin Times written by Aunt Arctic hit 100 issues, there was a small party thrown on the island in the Boiler Room. It took place on September 13, 2007 and lasted for the whole week until issue 101 was released. What makes this even so iconic is the fact that we are now well into the 500's regarding newspapers, and it seems like so long ago that the newspaper was released. The Penguin of the Week for September 12, 2015 is a penguin named Fluffy32212. They were nominated by their friend Jia752 on the Club Penguin blog. Jia752 said this about their nomination: "Hi Megg ! I Want to Nominate Fluffy32212 Because He is Always Helping Others and He Has a Unique and Great Style. Please Nominate Him. He Has a Talk Like a Pirate Day Themed Iggy. Please Nominate Him. He Has Been Helpful To Everyone On The Island. Thanks." Congratulations to the winner. They have won 10,000 coins and the official POTW background. Waddle on! Rookie has sent a new EPF message out to all the agents on the island for September 24. Let's see what he has to say. The following message is for Elite Penguin Force agents only, caution! Umm... okay Rookie, will do. So much for 'EPF agents only'. The Club Penguin community is talented. That's a fact. There are so many people that are a part of this community on Twitter and various fan websites and blogs, that have such a talent when it comes to drawing! Usually, I take a look on what some penguins have submitted to the Club Penguin website, as often there is some gems that can be found. Today I was checking it, and I noticed a particularly eye-catching piece of artwork. It is a visualisation of the Ski Hill, with some penguins hanging out there, watching what I believe to be the northern lights show(?). I am saddened that the original author did not sign it but nonetheless, it is a wonderful piece of art! Club Penguin have updated recently for September 23rd and they've brought us the regular new updates as well as a lot of blog posts this past week. Let's check out this weeks summary of everything new. 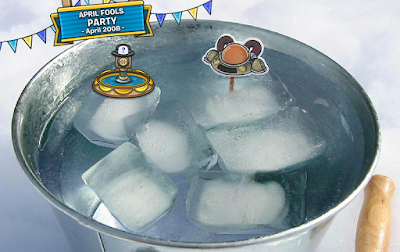 Club Penguin Anniversary Party HUGE Sneak Peek! 10th Anniversary Party—Get a FREE Gift Every Day! 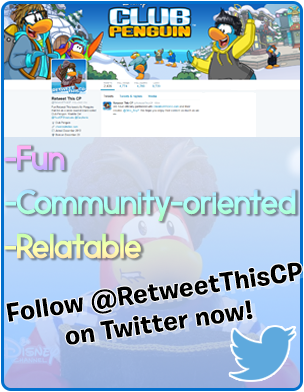 The 518th issue of the Club Penguin Times, the island's weekly newspaper has been published. 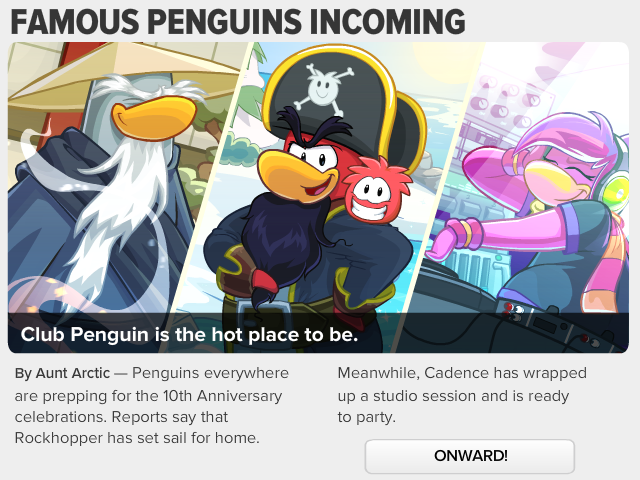 Today's top headlines are 'Famous Penguins Incoming', an article written by Aunt Arctic regarding preparations for the anniversary party, and 'Villainy at the Isle of the Lost?' also written by Aunt Arctic, an insightful article about mischief happening at Audaron Prep. You can read the articles below. Of course, the Upcoming Events will also be listed here. 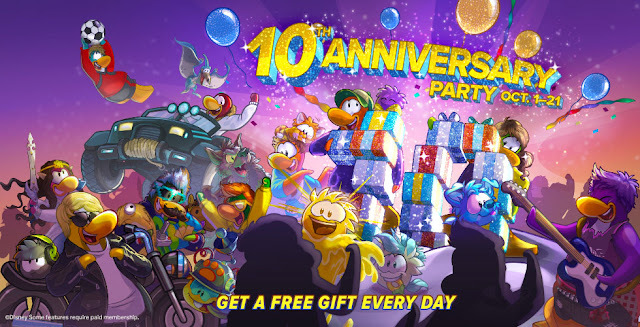 Club Penguin 10th Anniversary Party - Get a FREE Gift Every Day! The Club Penguin 10th Anniversary Party is nearly here, and with the party running from October 1 - 21, you can get a free gift EVERY DAY! How cool is that? Click on the image below to enlarge it. 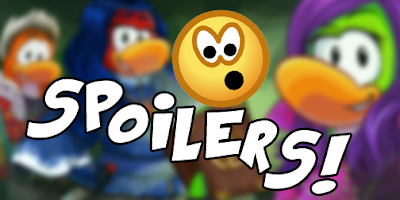 From the sneak peek posted on the blog, we know much about the dinosaur puffles and the freebies even for non-members, so to hear some more news is excellent. I am thrilled to see that we will be able to obtain free gifts every day. What do you think? Ever wondered what puffles would look like as some of your favorite Disney Descendants characters? Well wonder no more! One of our artists, Waddledodds, sketched out what he thought puffles might look like dressed up as Mal, Evie, Carlos and Jay. Aren't they just the cutest?! Which one is your favorite? Ahoy mateys! Club Penguin's most popular pirate captain and mascot, Rockhopper, was visiting the island for Talk Like a Pirate Day, September 2015. 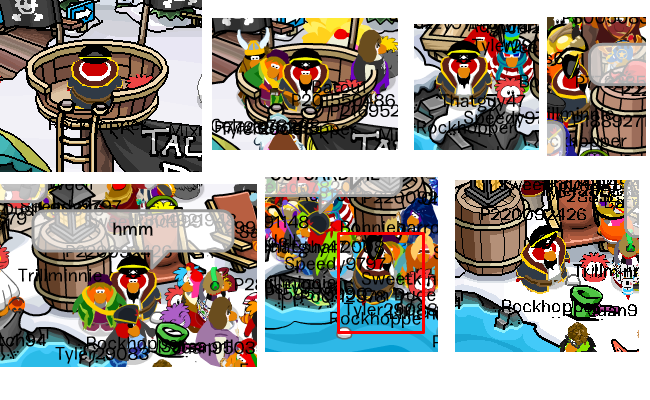 He rowed to the snowy island and docked his boat at the Beach when he heard that we penguins were celebrating! Today, he wrapped up his visit with a final get-together at the Beach. It was grand! 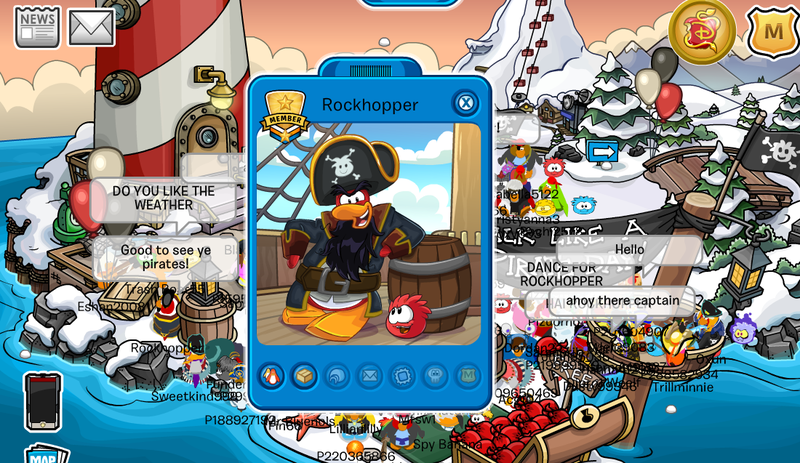 Rockhopper arrived at 3PM PST, told us a few stories, shared his tastes in cream soda and stinky cheese, and added all of his fellow sailors and gave them his very own background. He even told us a story about how some pesky pirANTS stole his stinky cheese of his very own ship, and how he had to get it back. Aunt Arctic once told us "[Rockhopper] is always up for a pirate parade, and enjoys a good pizza party—so if you happen to meet him, be sure to join in. And don't mind the odor. It's just the stinky cheese he keeps in his beard for later!" and I have to admit that is true, sorry RH! So here we see Rockhopper when he arrived, and he be lookin' as splendid as ever. I asked him about his cream soda drinking habits, and he responded. Here are some random photos I got when the captain arrived. Scroll down to see them all. The Penguin of the Week for September 12, 2015 is a penguin named Turtlebuddy2. They were nominated by their friend Flyingpancak the Club Penguin blog. "I would like to nominate Turtlebuddy2 for Penguin of the Week. 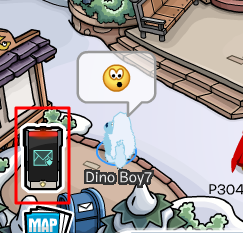 I met him around 2008 when I started Club Penguin, and he was at the Ski Village waiting for someone to give a tour to. He was really polite and showed me around the rooms of Club Penguin, and now I have been friends with him since!" Congratulations to the winner. They have won 10,000 coins and the official POTW background. Waddle on! Greetings readers! 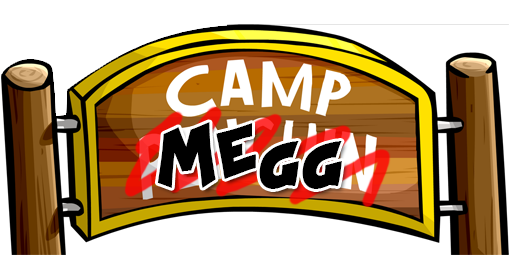 Today on the Club Penguin blog, our favourite moderator, Megg, talks to us about her camping adventures. It is an interesting read if I do say to myself, so feel free to see what she's been up to! Her blog post is below. Unusual activity has been detected at the school. Go undercover and infiltrate it, agent! You heard the Director! Calling all Elite Penguin Force agents. Report to the school immediately! Club Penguin Operation: Blackout Breaks Records! 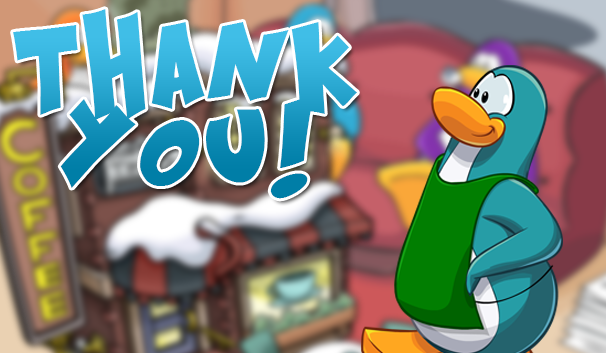 The Club Penguin blog has been rewarding us this week, the Anniversary Party SNEAK PEEK post has just been created!! Club Penguin Free Pirate Bandana and Beach Decorations! Ahoy mateys! 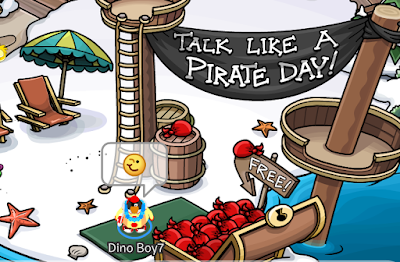 September 19 be Talk Like a Pirate Day, and what be a better way to celebrate than for Club Penguin to decorate their own Beach and give out a free pirate bandana for all ye to wear! The Beach is decorated because Rockhopper is visiting the island this month. To get your bandana, just head to the Beach on your map and click on the free box. Megg's alert on the What's New blog about the launch of the new party is super helpful! Are you ready to be rotten to the core?! I hope so because the Disney Descendants party is ON NOW! Which character is your favorite and why? Let us know in the comments below! Need help? 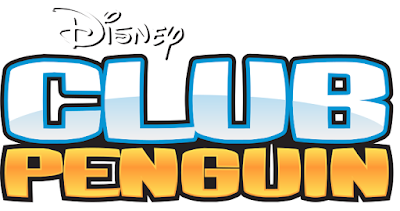 Read my Club Penguin Descendants Party Walkthrough 2015. 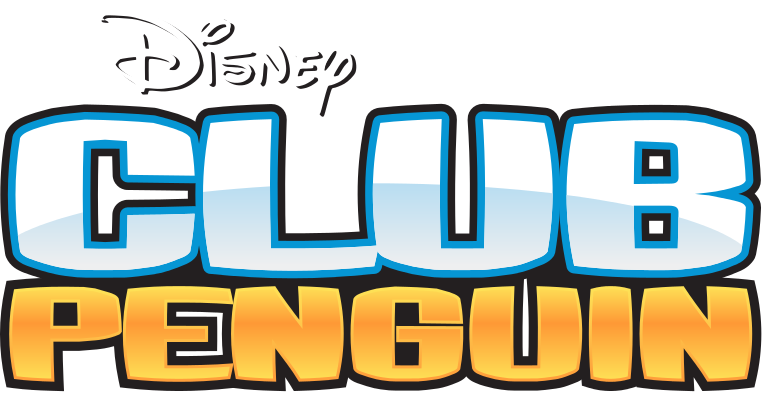 Club Penguin have updated recently for September 16th and they've brought us plenty of new things including a new party. Let's check out this weeks summary of updates and new stuff. 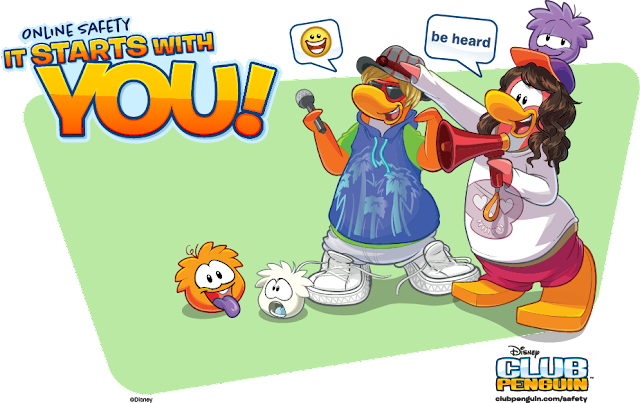 LAST DAY To Share Your CP Memories! The 'X' indicates the article is outdated or irrelevant as of this posting due to the date of release passing. It is still listed as all of the weekly posts are archived here. 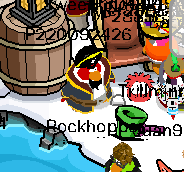 Rockhopper will be visiting the island of Club Penguin for International Talk Like A Pirate Day 2015. You will be able to meet him on the island from September 17 to September 22. All times are in PST (Penguin Standard Time). He will be at the Beach on Club Penguin. Club Penguin have released a new party for the Disney Descendants film: the Descendants Party 2015! This takeover/party will run for the next two weeks on the island. After that comes the 10th Anniversary Party and possibly the Halloween party. This post will be showing you a complete walkthrough for the 2015 Descendants Party. In this cheats guide I will show you how to get the free items for ALL players, the rooms that have been decorated for the party, and generally give you an insight to what the party is all about! Hey, I’m Mal. The Descendants are taking over CP University! Time to be bad – in a good way. First of all, you'll need to click the Descendants logo in the top right of your screen. Then you can click the claim button for each of the items! 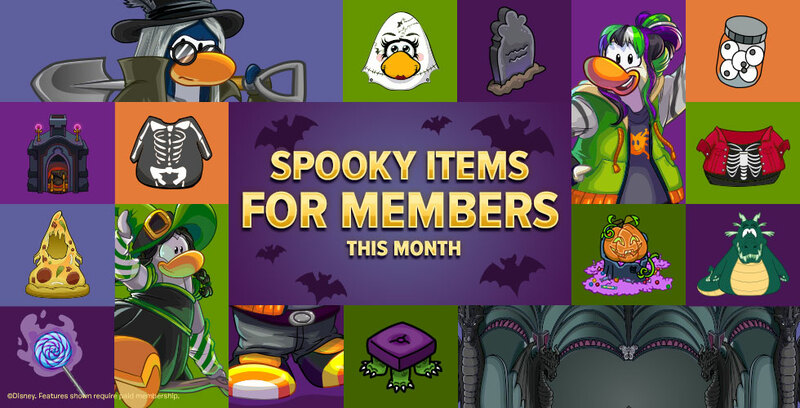 Members get access to better costumes, but there are some really neat items for the non-members, thanks CP! Read on to learn more about the party and the rooms! 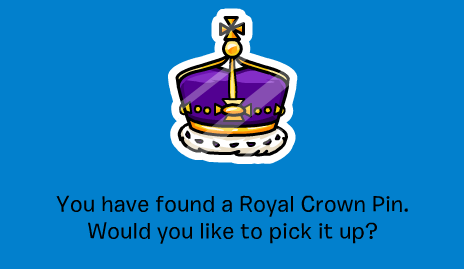 It has been two weeks since the Royal Scepter pin was hidden on the island of Club Penguin, so a new pin has been released on the island for penguins to find. 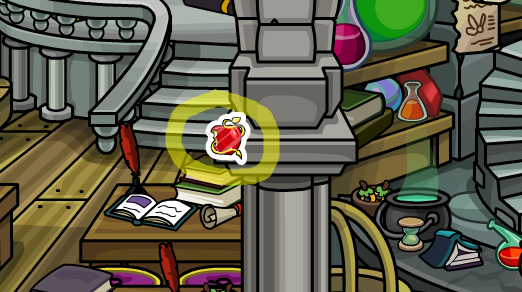 Today I'll be showing you how to find and collect the Royal Crown Pin on CP. Just follow these steps. Open Club Penguin and log in. 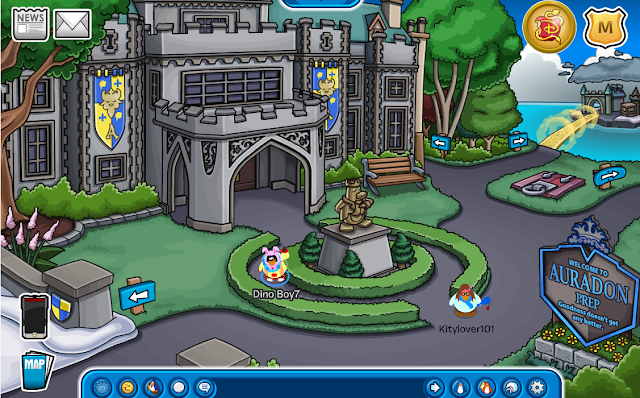 Click on the Ski Village, and enter the Ski Lodge (Puffle Lodge). Waddle over to the mullet. On top of it is the royal crown. It will come up with a message. Click yes and that's it. You know have the NEWEST pin on Club Penguin! Woo! 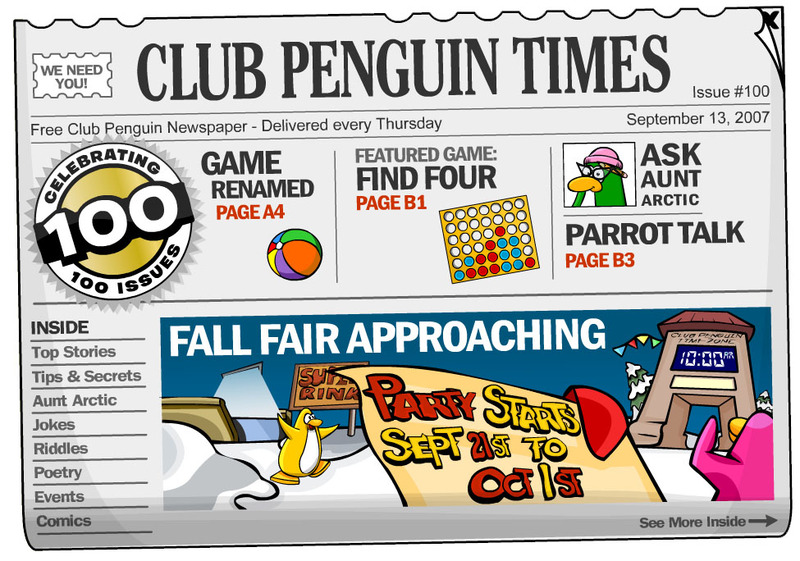 The Club Penguin Times newspaper issue for September 17 has been released on the island. This is their 38th issue this year, and 517th issue overall. Below you will find the top headlines and news from this week in Club Penguin. 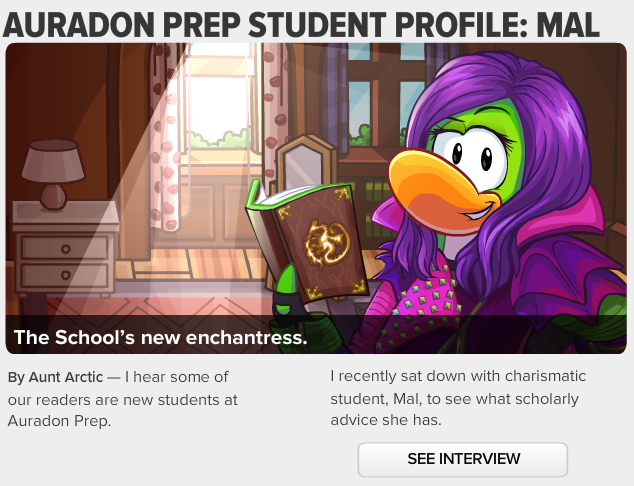 First article: Auradon Prep Student Profile: Mal. Written by Aunt Arctic. 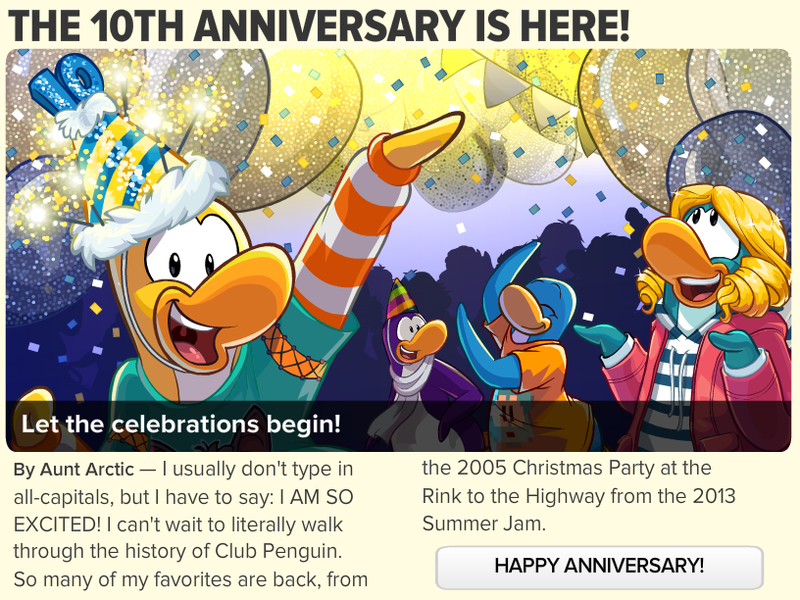 Second article: 10th Anniversary Wishes, also from Aunt Arctic. This is a good read! I'll tell you that for free. Club Penguin Blog: LAST DAY To Share Your CP Memories! Megg has made a new post on the Club Penguin What's New blog informing us that it is the LAST DAY to share our favorite memories of CP to the Fun Stuff section for Cadence's "Gonna Be Epic" music video, releasing as an exclusive for the celebration of the 10th Anniversary Party on Club Penguin. Hey penguins! 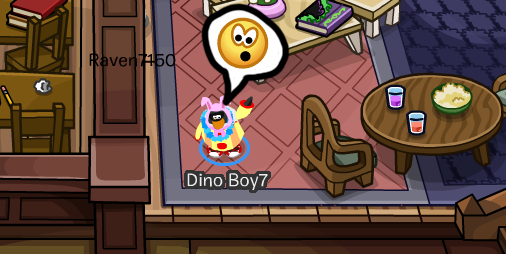 Dino Boy7 here. Megg has announced, on the What's New blog, the featured outfits for September 14, 2015! Let's take a look at who won shall we? You can click the image to be redirected to the official Disney CP blog.